Ice cream treats with studio friends after Finals were over. I wrote about Masquerade Nationals already, but thought Finals deserved its own post. I also realized a few things that I forgot to mention in my previous post. I forgot to mention the great boutique shop at Nationals. I know in the past I have talked about it, but it’s still worth bringing up again. Programs sold for $7, a great price for this thick program! It not only listed the names of each studio and dancer, but also had space in the back to write all the placement awards, and Finals lineup. For me, having space to write down results, is an important part of the program! They also had a deal – you could purchase a program, sweat pants, and a “city t-shirt” with the names of all the dancers in the competition on the back, for $50. Grace already had the sweatpants, so I got the deal for me. 😉 Grace got a cute pair of shorts (with built in bikers) and tank top for $15 each. I always enjoy shopping in their boutique, even if I end up buying more than I had planned on. I also failed to mention the food choices available at this venue this year. Since changing names (owners? ), they have better choices of food. It’s still quite expensive, but is also a better quality. There is pizza, which is too greasy, but tastes good once you soak a few napkins with it. There is also an over-priced walking taco that is ok, but a nice change from soggy subs, and the line is shorter than walking a block away to Subway. Grace has suddenly gotten into salads, Caesar salads in particular. They had huge salads for sale. Grace got one almost every day, and really liked it. Me? I discovered an Asian restaurant just a block away that I decided to try with another dance family. It was delicious, and I will likely go back. Just for fun, they had a backdrop for people to take pictures in front of. We, of course, had to take advantage! They also had a photo booth available on one day of the week. People could get their pictures taken in it, and each person got their own copy of the photos. The most awesome part? It was free! Just another reason we love Masquerade. They try to keep it fun for everyone! On to the point of this whole post!! Finals day was a big day for LADC! Every group, except the Angels (Grace’s group), were in the Finals. Even though Grace wasn’t dancing, we went to cheer on our teammates. As I mentioned, we had 5 dancers participating in the Parade of Stars (Opening Number). It was a fun dance choreographed by Sarah Jo Fazio (a favorite judge), and Marlowe Howell. The first dance off of the day was Petite Encore Performances. 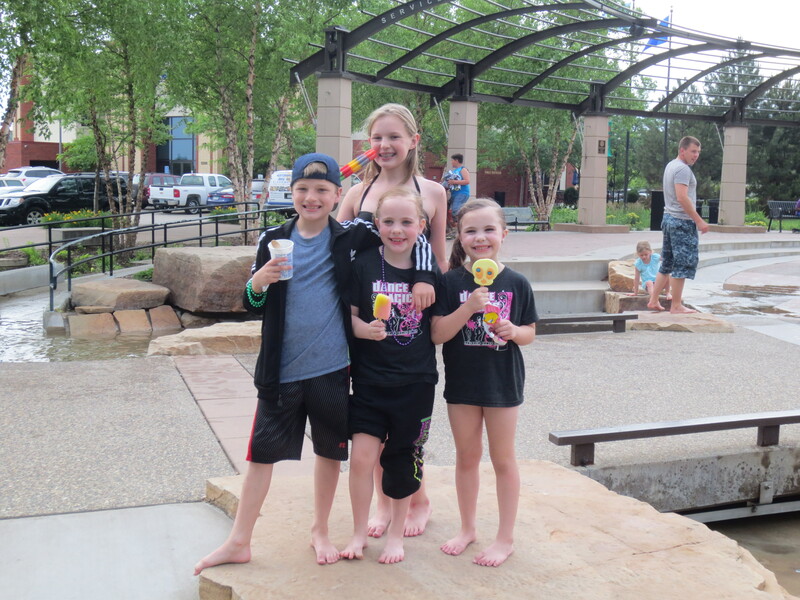 Our Sparkles (ages 8-10) performed their jazz dance, Proud Mary. At the end of the night, they ended up winning the Petite Encore Award!! After their division, there were several others that contained awesome dances. Finals really is a great show to watch – best of the best, really! After several other divisions, it was time for the Junior Dancer of the Year Finals. LADC’s own Sage Neal was one of 5 girls who made it to the finals. Each girl had to perform a solo. Sage did her musical theater solo, which was perfectly choreographed by Kyle Gross to show off her personality and showmanship. She was amazing!! 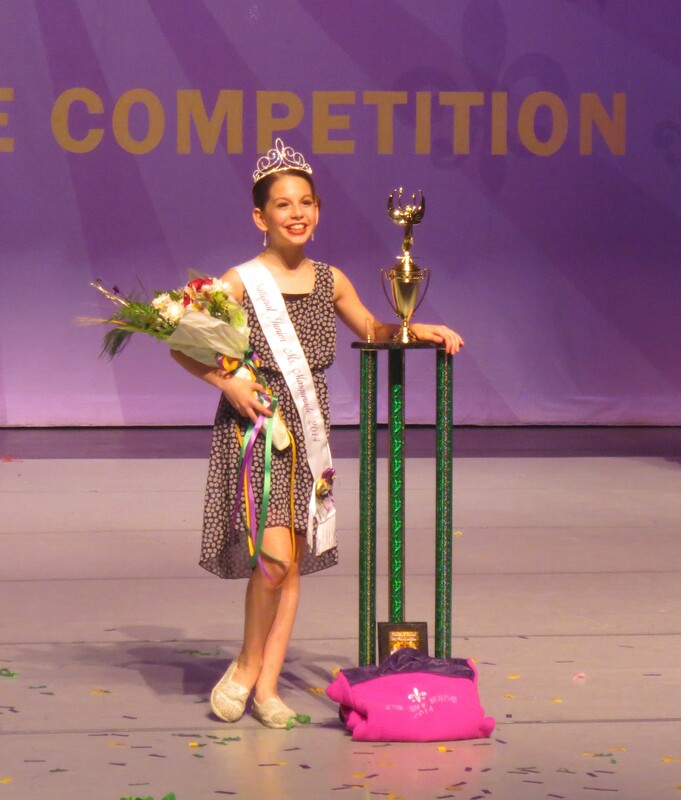 Not only did our sweet and sassy Sage win National Junior Dancer of the Year 2014, she also won the National Title of Junior Miss Masquerade!! This title was well deserved. Another amazingly talented junior, Olivia Johnson, was the 1st runner up for National Junior Miss Masquerade 2014!! As the day went on, we watched Sage also perform her contemporary solo in the Junior Division National Champion Dance Off. We also watched one of our small groups compete The Bird in the Mini Division National Champion Dance Off , the amazing Madelyn Lee from LADC perform one of her solos in the Finals for Senior Dancer of the Year, and we participated in the Spirit Parade. Our dancers apparently got a little over-eager throwing candy out in the audience, but it was fun. The afternoon went on with more awesome dances… in my comments in my program, I wrote “anyone’s game.” All the dancers came to win, and proved it on stage! The only negative comment I wrote, was that when announcements are being made, they need to turn the music down. It was difficult to hear sometimes what they were saying. 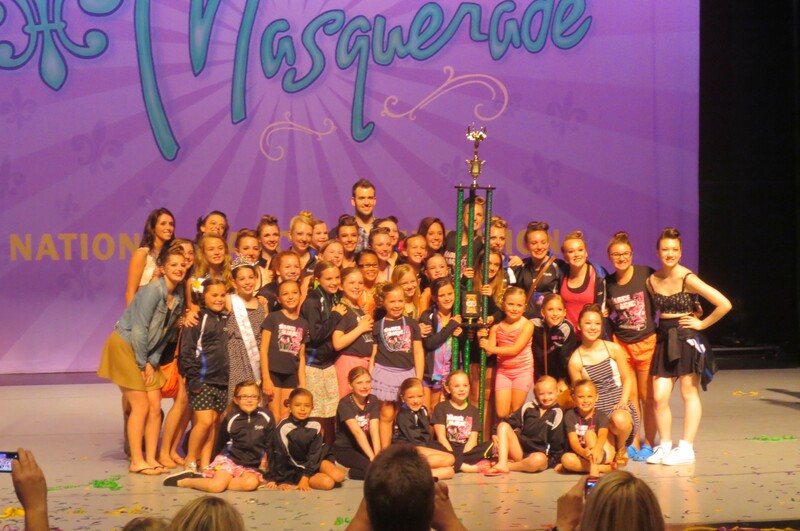 Lake Area Dance – Intermediate Studio of the Year 2014!!! We got to watch the littlest dancers from our studio perform their tap dance called Wash That Man. The oldest competitors performed their jazz dance Betty’s Wake. While they didn’t win the National Champion Large Group Dance Off, studio owner Maria Pomerleau did receive a choreography award for it!